Four-color process printed on Side 1 of 130lb C2S White Dull stock coated with Aqueous Stain. H8 business card slits on left pocket with B8 brochure slit on right pocket. 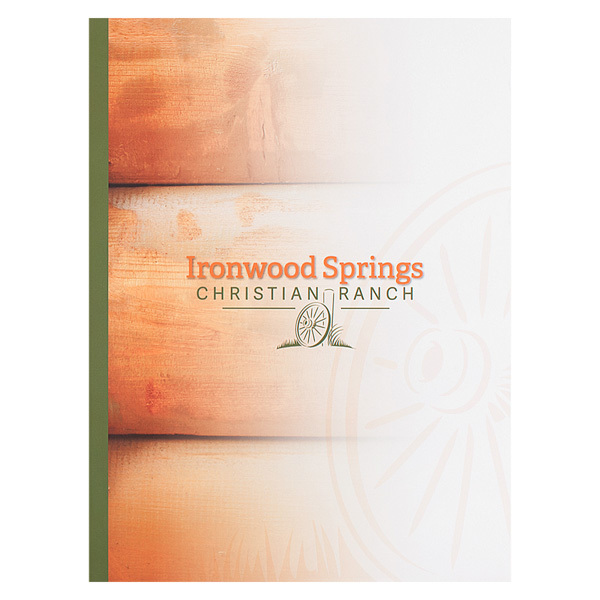 Ironwood Springs chose a rustic design for its folder. The Christian Ranch's name and logo are in the center of the cover, which looks like the side of a log cabin or barn. A large wagon wheel drawing is on the edge of the cover, inviting people to look inside. The wood paneling continues on the wavy pockets inside. Ironwood Springs' wagon wheel logo appears on the right pocket and on the back. Side 1 printed with four-color process and 1 foil stamped area. Side 2 printed with 1 PMS color using heavy coverage. 12pt C2S Semi-Gloss stock coated with Aqueous Matte. C5 business card slits on right pocket. 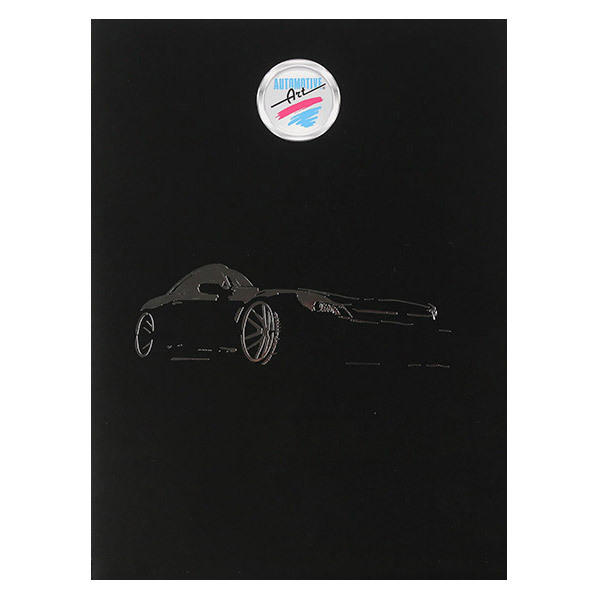 A long, lean sports car in Metallic Silver foil glistens when light hits Automotive Art's black background. The auto care retailer's logo looks like both the metal brand symbol on a car's grille and a full moon, as if the sports car is prowling at night. The brand's sky blue and hot pink colors illuminate the inner panels with a neon glow reminiscent of '50s and '60s hot rod paint jobs. Two wavy interior pockets mimic the curves of a performance car's fender. On the left pocket, viewers can see a faint replica of the car from the cover, next to the brand's logo. Side 1 printed with 1 foil stamped area, 1 embossed area, and 2 PMS colors using heavy coverage. Side 2 printed with 1 PMS color using heavy coverage. 80lb White Smooth stock uncoated. D3 CD/DVD slit on left pocket, with H8 business card slits on right pocket. This vivid design for the American Society of Radiologic Technologists Foundation is hard to miss with its Metallic Pewter logo on a bright green panel. Curved lines on the cover mimic the oval logo. Blue pockets and interior panels soothe the eye after viewing the energetic exterior. The cool color and wavy pockets evoke images of flowing water, hinting at positive movement for members of the ASRT Foundation. Four-color process printed on both sides of 14pt C2S Semi-Gloss stock. Coated with Aqueous Soft-Touch on Side 1 and Aqueous Matte on Side 2. H8 business card slits on right pocket. 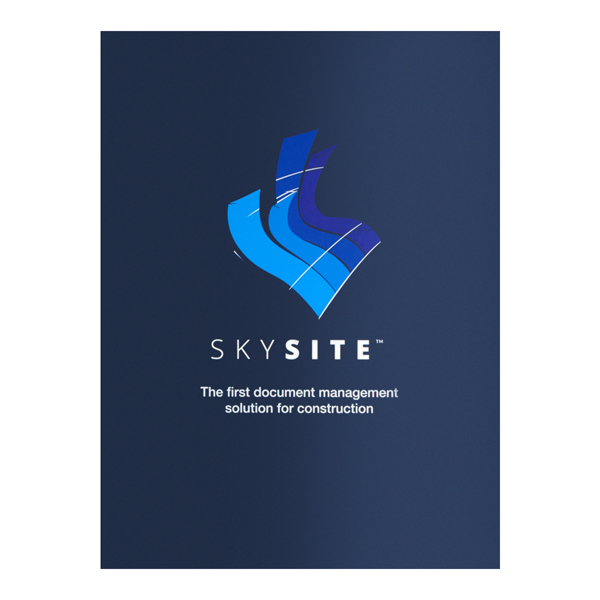 ARC Document Solutions promotes its SKYSITE project collaboration and document distribution app with this rich blue design. Wavy pockets match the wavy lines in the logo and create motion. A blue skyscraper spanning both inner panels reinforces the product name and shows the type of office that might use SKYSITE. Product info on back leads to the brand's phone number, so clients can learn more. A traditional cover leads to a custom curved die-cut interior, with the pair of wavy pockets holding 8 1/2" x 11" papers. To create a cool, modern look and give the design a sense of rhythm, the pockets work together to imitate a wave's trough on the left as it crescendos into a wave's crest on the right. Because the right pocket is slightly larger than the left, its contents are extra secure. Its size also creates a larger imprint area on which to place important information or creative visual elements.